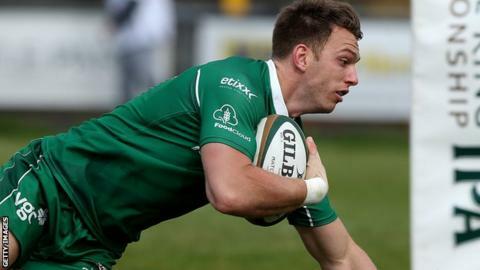 London Irish director of rugby Nick Kennedy has called for "no let up" from his squad despite being well set for the Championship play-off final. Irish take a 35-3 lead into the second leg of their semi-final against Doncaster Knights on Saturday. "We can't go in at half-time too happy, so we'll look to put our best game on the park yet again," Kennedy said. The Exiles, who finished top in the regular season, are aiming for an immediate return to the Premiership. "If you'd offered me that lead at half-time, I'd have bitten your hand off," Kennedy told BBC Radio Berkshire. "But Doncaster are a team that can score a lot of points. "So we can expect them to come up with some different tactics in the return leg and perhaps run it a bit more with a very dangerous back three." Irish lost just one game in the regular season and look set to meet runners-up Yorkshire Carnegie, who take an 18-point lead into their second leg with Ealing Trailfinders on Friday, in the two-legged final.